Like so many classic Russian ryes, Moskovskiy starts out with a sponge and a scald that incorporates not only rye but also red rye malt and caraway. The sponge is hydrated to only 70% and it ripens at 85°F/30°C, which favors acetic acid production by the LAB. The scald matures for just 2 hours, which is sufficient to produce the chocolaty sweetness that’s characteristic of the red rye malt. The opara, which is a technique I’ve only found in Russian and Baltic baking, combines the scald and sponge with additional rye flour and a small amount of yeast. It ripens at 80°F/28°C, which favors yeast activity and strengthens the leavening power available to the final dough. The dough itself is very soft and sticky and after bulk fermentation needs to be transferred directly into the pan, where it undergoes a brief proof before a dry bake. The bread itself is surprisingly delicate, with a tender, open cark brown crumb and a flavor profile that combines subtle notes of chocolate, coffee and rye accented by a faint cumin edge and a mild, well-balanced sour finish. IMO, this is a bread every rye lover should try at least once. Combine the sponge ingredients and hand-knead into a firm dough. Cover and ferment for 6 hours in a warming oven or proofing box set at 85°F/30°C. If you don’t have a proofing box or your oven can’t be set that low, preheat to 100°F/38°C then turn the oven off. The sponge will double in volume. In a separate container, combine the scald ingredients, cover and let stand at room temperature (70°F/21°C) for 2 hours. The scald will have a very chocolaty color and smell. Combine the rye flour, yeast sponge and scald in the mixer bowl and hand-knead into a stiff dough. Cover and ferment at 80°F/28°C for 3-3½ hours. The opara will not have visibly expanded, but it will have an intense sweet-sour smell. 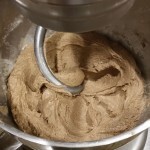 Add the flour, salt and molasses dissolved in the water to the opara, and use the dough hook at low (KA2) speed to mix into a soft, sticky dough, scraping down the bowl as needed, 6-8 minutes. Smooth the dough with wet hands, cover and ferment at room temperature for about 1 hour. The dough will double in size and show cracks or broken bubbles on the surface. Use a plastic dough scraper to transfer the dough to a well-greased 8½”x4½”x2¾”/22x12x7 cm loaf pan. Distribute and smooth the dough evenly with wet hands. Cover and proof at room temperature until the dough is level with the rim of the pan, 15-20 minutes. Preheat the oven to 410°F/210°C with the baking surface in the upper third. Bake until the crust is deep brown and the internal temperature is at least 198°F/92°C, 40-45 minutes. Transfer to a rack, unpan and immediately spray or brush with water. Cool thoroughly before slicing. Rye sour and rye malt where to buy? You can buy rye sour, i.e. sourdough starter, from a lot of different vendors online, including King Arthur … or you can ask a baker friend, or you can build your own: there are tons of online formulas. thefreshloaf.com is a very good place to start if you decide to go that route. As for rye malt, you can buy it from my business, http://www.nybakers.com, or from any home brewing supplies outlet, either online or storefront. To make red rye malt, roast the pale malt in a skillet over medium heat for 4-5 minutes, until it turns a brick red, then grind it in a spice grinder or blender. 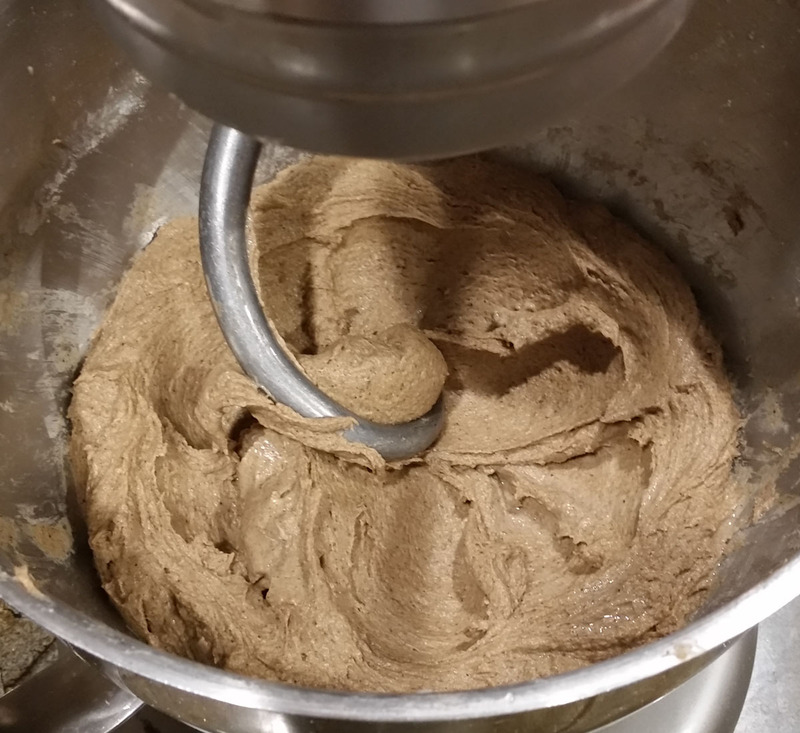 I prefer cultures that start from scratch, with nothing more than organic whole rye flour and water. Others favor pineapple juice, plums, grapes, and so on. It’s really a matter of preference and what works for you. What is it that can diminish the gumminess of the rye pentosans….acidity of the sour starter ? increased acid with overnight starter and/or overnighting the scald or increasing the proportion of wheat, perhaps longer, lower temp bake ? Have made a Borodinsky twice and crumb has been gummy moist despite 200 degreed F internal temp. Not sure how to modify method. No yeast and small percentage of whole wheat in the recipe I used. Brand new to rye breads but will definitely get the book ! One of the surest and easiest ways to reduce the gumminess is to let the bread stand 2-3 days before slicing, which stabilizes the crumb. Alternatively, gumminess is often a sign of overfermenting, either at the bulk or proof stage. If the loaf is still gummy after 3 days or so, try reducing fermentation by 10-15 minutes on your next bake. Thank you. I think the delayed slicing might be all that’s needed. Other advise appreciated. Anxious to understand the chemistry that’s going on here. Are you sure about using cumin in this bread? The name of caraway seeds in Russian is тмин (pronounced as tmin). I believe that it is some confusion between two different spices. you’re right. i thought i’d changed it in the recipe, but clearly i hadn’t, but have done so now. I am planning to buy your book and would also love to try this recipe. I was wondering however if this, and other recipes, will work without the yeast spike. I like to try to not use yeast, but maybe the recipes are doomed to failure without it? Thanks for your thoughts, and also for these great recipes. I suggest trying the recipes first as written. Obviously, if you have legitimate medical reasons for avoiding commercial yeast, then by all means eliminate it and let the wild yeast present in the sponges do all the work. However, because of rye’s chemistry, the elimination of the yeast spike will prolong fermentation and potentially result in an unpleasantly dense loaf. 8½”x4½”x2¾”equals 105.18 cubic inches (1723 cubic centimeters). I used the cm dimensions in order to scale the dough for my 23x10x10 cm pan and made 1165g of dough, which should have been 1249g instead. The dough seemed too little, since knew that usually rye bread dough should be 0.65 of the pan volume (650g for 1000 cubic centimeters pan)), but I tried it anyway. Made this bread and, a couple of flubs on my part aside, it turned out fantastic. I fermented the sponge at room temperature (a tad more, it caught a little sunlight) for 6 hours and I suspect this is the reason that I ended up with the stickiest opara and final dough I’ve ever worked with. I would suggest that other bakers mix their instant yeast into the scald before adding the rest of the ingredients for the opara, since I could see the flecks of yeast sitting in the opara the whole time it was fermenting. After letting the dough double in size and realizing that there was no way I’d get it out of the bowl in one piece, I was forced to de gas it as I took out hunks and stuffed them into the loaf tin. Is there a trick to this, or would properly fermenting the sponge have been enough? Thanks for the great recipe! I appreciate you taking the care to make the timings and temperatures reasonable for a home baker. I’ll definitely be making this one again. Is the red rye malt essential? Not essential, but helpful …. it adds nice burnt-sweet flavor notes. Could you share a picture of the Scalded Rye Bread (page 285 of your book)? Thanks.